What a great start to a new Trilogy. It took me a few chapters to realize that each one was labeled with what character was narrating that part of the story. The prologue is in Tai’s perspective, which I didn’t catch right away, so when it went to Chapter One and it was Remy’s perspective I was slightly confused. I was thinking the Prologue hadn’t happened yet and we were building up to it. I felt pretty silly once I realized my mistake and I never made that one again. After the first chapter it just jumps back and forth between Remy and Valerian (Vale). I really liked this because each character is in a different place physically, one being part of the resistance and the other being part of the Okarian Sector, so you really get a feel for both places that you wouldn’t get if it was just from the perspective of one single character. It’s easy to label Remy as uncaring by the decisions she makes, but as the reasons come out as to why she makes those decisions you can’t help but feel connected to her. I think Vale was my favorite character, which is unusual. I don’t usual favor male over female characters, but I liked that once Vale was made aware of the problems with the Okarian Sector, he set about to find the truth no matter what the cost. And then he did something about it. Remy was kind of forced into the decisions she made because her parents took her with them, but Vale chose for himself what path he was going to follow and I admire that. I’m eager to see what happens next in the Trilogy. I feel like sometimes you can guess where a story is going to go before you read it, but in this case I’m not really sure. I have my hopes, but I can see the author(s) surprising us with some unexpected twists along the way. Especially since The Sowing was written by a mother and daughter writing time. Loved the joint effort and input of ideas. I’m sure the next one won’t disappoint. 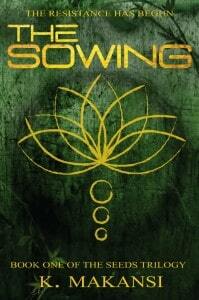 Check out the other blogger’s reviews of The Sowing! My son is looking forward to reading this one soon! I’m glad you enjoyed it. Thanks for being on the tour.